I have quite a few blueberry muffin recipes on my blog. Blueberry Cream Cheese Muffins and Blueberry Breakfast Cake and Blueberry Banana Banana Bread with Brown Butter Glaze. (not to mention all the other blueberry recipes and desserts!) But this Blueberry Pie Muffin is by far my favorite! I had honestly thought there was no need to add a new blueberry muffin recipe here because you can’t (and shouldn’t) mess with perfection. But, as is often the case, I was wrong. ha! There is a unique step in this recipe which involves making a “pie crust” crumb and then topping the muffin with it. I was skeptical because it adds a good 30 minutes to the prep time. 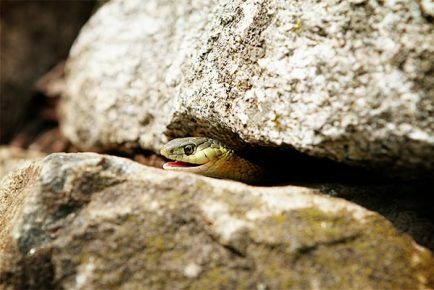 In this fast-paced world, who has time to let crumbs cool? Well, I did it. And I am so glad I did. They add a texture that isn’t like other crumbs. It isn’t bursts of sugar. It isn’t flour-y clumps. Buttery. Crisp. Firm, yet tender. Flakey. Golden. Here is how my crumbs looked directly out of the mixer (on the left) and then after they had cooked and been crumbled. (right) To crumble the pieces I used two forks and just separated as many big bits as I could. They cooled enough to use after about 10 minutes. If you do not have a cast iron skillet, you can brown crumbs on a cookie sheet. You may need to cook for about 10 minutes longer and to break up crumbs halfway through baking. It’s been a while since I made muffins and did not use cupcake liners. Not using liners is something I should do more with breakfast muffins, as it allows the edges and sides to develop a nice crust that you just don’t achieve with cupcake liners. More golden buttery flakey awesomeness. You can butter or spray your pans or use my homemade goop, which is just homemade pan release. It works great! So I don’t know if you have heard, but people tell me all the time… “toss your blueberries in flour to keep them from sinking”. I have tried this. I have tested this. Heck, I have even recommended it to others! But the truth about how to keep your blueberries from sinking is all about the batter recipe. 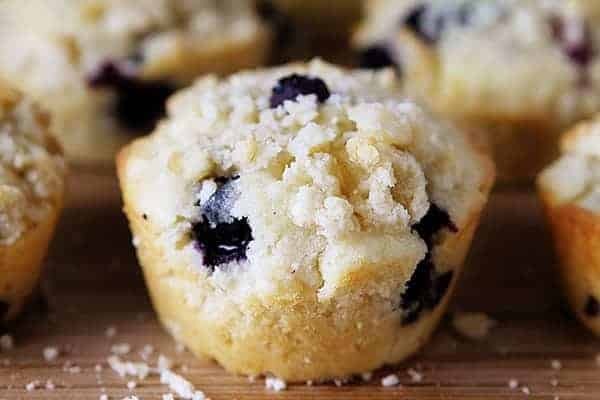 If you are using a good recipe that has the right ratios of fat, sugar, and gluten then your blueberries should move with the batter instead of sinking to the bottom. The “toss the fruit in flour” method has been debunked time and time again. Try testing it yourself next time you bake! At the end of the day, I know that if I am going to claim the “best” Blueberry Muffins Recipe… they have to be amazing to earn my seal of approval… and these did. 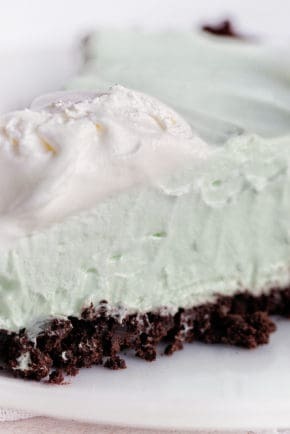 That crumb adds such amazing texture and the recipe is seriously delish! 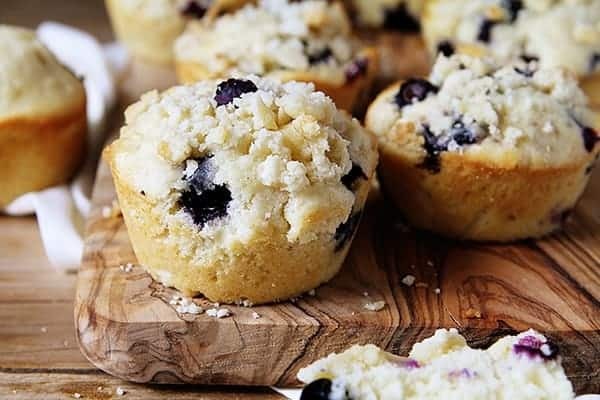 This Blueberry Muffin Recipe is subtle perfection! Love these? Check out my favorite Peanut Butter Banana Muffins! 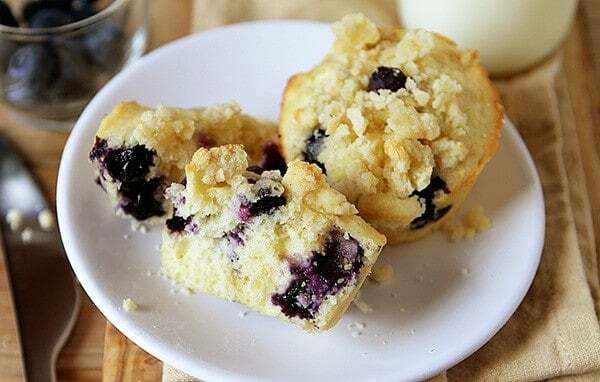 i can never go past a good blueberry muffins.. these look so delicious and so moist. 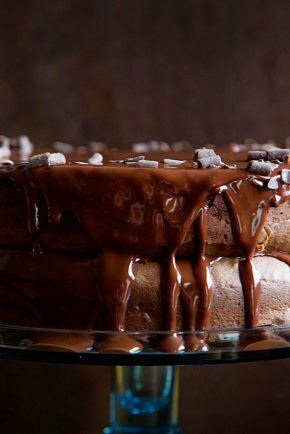 definitely saving the recipe to try in my kitchen.. thanks for sharing! 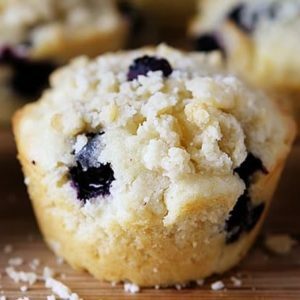 Blueberry muffins are my favorite…especially when they have a crumble topping, and especially x2 when it’s PIE crust crumbs. Ah-may-zing. Pinned! Thank you Taylor!!! You are the best! Maybe I’m just overlooking it, but do you add the flour mixture right before the blueberries? These look great! do you think they would work with other berries? I was just thinking about trying with our raspberries! Pie crust crumbs: how great! 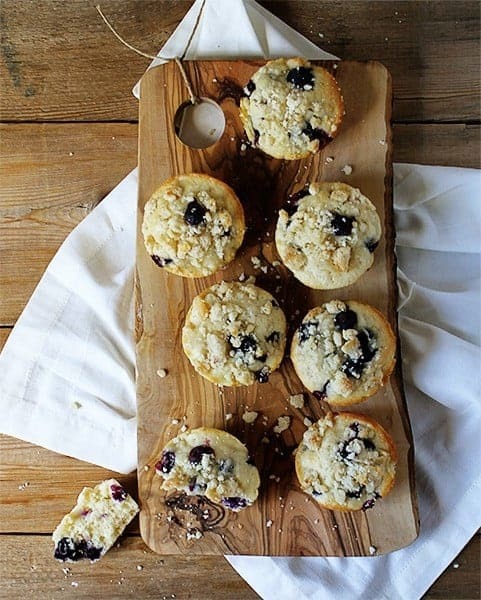 a blueberry muffin sounds SO good right now. loving this pie inspired version!! Oh my goodness these look AMAZING! Love the crumb topping! 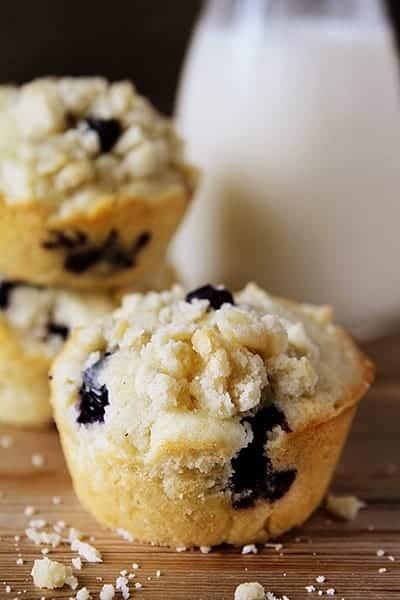 Blueberry pie muffins sound delicious! I will muster the patience to let the crumbs cool! I just want to say that I came over your blog a few days ago, and I have been reading ever since. You are such a good storyteller and I LOVE your mummy section. I have no kids on my own yet, but if I ever do I hope I can appreciate things they way you do. You are so funny and honest in your blog and I have been crying and laughing simultaneously on some of the posts. WOW, you are truly a superwoman. 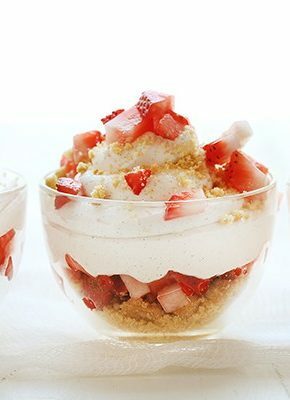 I love the thought of putting little crumbles on the top. Nice work! Beautiful pictures! A “pie crust” crumb for these muffins?! Brilliant!!! Oh wow. Yes, yes you need to try another blueberry muffin recipe if these were the result! They look amazing! Thank you Julie!! Hope you are feeling good girl! Just made these. Delicious! I’ll definitely make them again. I only did ¼ cup of batter (NOT heaping) per muffin cup and did not get 24! Only got 19 🙁 How many cups are in your pans??? Also, with 2-3 TABLESPOONS of crumb topping per muffin (loaded up each muffin to use up as much as I could) I still had almost ¾ cup of crumb topping left! End result was still good, if a little over done. I think I’ll bake them less next time. I have tried a few I Recipes And would love to try many more and my family would love it !!!!! Phenomenal. Surprisingly easy batter even for me. I prefer sweeter, but not supposed to have any anyway. 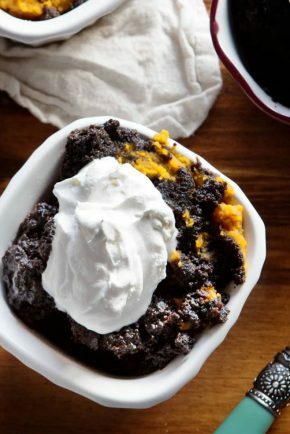 Definitely will share and make this recipe many more times. NOTES: I used fresh frozen blueberries because I waited too long and had to freeze what I bought. My blueberries all remained suspended because of the wonderful batter. I did not coat them in flour. About me: I enjoy cooking real meals. I find cutting, chopping, assembling, etc. therapeutic. … lol. 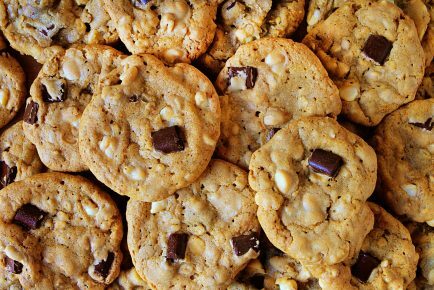 On the other hand, I hate to bake goodies: while I am precise in other parts of my life, the required precision to measure and mix batters along with timing and watchful eye are dreadful activities for me. However, several times a month I haul out the flour, sugar, eggs, etc., and bake banana or blueberry stuff for my adult children (and sometimes enough to take to their work places), my auto shop, UPS, USPS, FedEx delivery folks, trash pick up workers, and girlfriend and her husband. The next time that you burn your tongue, try putting a teaspoon ( more or less ) in your mouth . Let it slowly dissolve on your tongue . IT WORKS !!! I don’t know where my Mama learned this wonderful little trick, but I grew up doing this. Still do !!! The Blueberry Muffins look Scrumptious !!! I was so excited to make these since I just bought fresh blueberries…unfortunately, I think precooking the topping is wrong & baking muffins at 425 degrees is too high so, therefore, topping too brown & muffins raw! So very disappointed, not to mention upset! I should have known better than to cook muffins at that temp!!! So should you “I Am Baker”! Did you not understand that the topping is cooked separately? Step 5 when you add the butter, buttermilk and vanilla. And you mix til just combined are there supposed to be big junks of butter in there. It doesnt blend together very well.